Local Commercial, Hotel and Hospitality Drapery Installers. Connecting commercial, hospitality contract drapery installers with fabricators, manufacturers and suppliers of hotel draperies and window fashions. Source Local Installers and establish installation teams while you build and strengthen your own network as a fabricator and supplier. Reduce Your Installation Costs using local contractors & installation crews on your commercial hospitality or retirement facility contracts. Build your team with reputable installers located in proximity of your next hotel or commercial project. This is your source to locate and establish installation teams while you build and strengthen your own network as a fabricator and supplier. 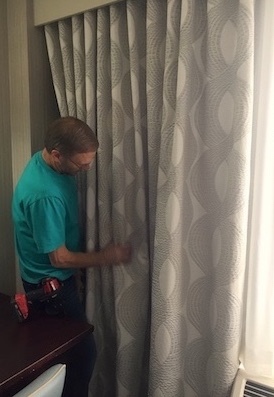 Installation of Hotel Drapes & Curtains involve manufacturers, installation teams and property management working together within construction schedules in harmony. Our commercial drapery contractors are organized professionals who are focused to turn floors and completed projects back on time. The installers listed specialize in a broad range of drapery and window fashion applications, including motorized and remote shade systems. Contract drapery installation services for new builds and full property renovations. All services listed are provided by individual contractors specific to hotels, resorts, retirement facilities and healthcare installations. CONTACT ONE OF OUR INSTALLATION SPECIALISTS TODAY! When you list your hospitality and contract services online with us you will get immediate exposure to fabricators and suppliers of hotel draperies when installations are required local to your area. Build valuable relationships that will serve your business well into the future. Take a moment now and register your installation services online for FREE today.